In Part 1 of my series on the development of the Pocket-Safe hammer shroud, I showed you my first prototype and explained how I realized, on further examination, that it wasn’t designed right. I wanted to close the top, and take it from the original injection-molded design to something that could be vacuum-thermoformed. So I called up David Shapiro of RapidMade, who did the original CAD model, and told him what I wanted to do. Although I was using Autodesk Fusion 360 on the “startup license” at the time, I figured that paying a professional to do this design was probably worth the money, and I was right. While David worked on the details of a thermoformed design (which called for a weird organic shape that was beyond my competence with CAD) and the die over which it should be formed, I looked at thermoformers. They’re expensive. Like, $1,200 without the vacuum system. But you can buy plans for the “Hobby Vac” system, which will do sheets of plastic up to 12”x18,” and build it yourself. The author of those plans says it will take you a couple of weekends and cost a couple hundred bucks; that isn’t remotely close to accurate. I spent 3 months working on it a few hours a day, and about $750. But that includes the vacuum system, which is well-designed, and it also includes the ability to scale down your plastic sheets as small as 6”x9”, which is perfect for prototyping. So it was worth it, at least for my “low cash, high labor” business model. I was a member of the now-defunct “Club Workshop” in Denver, which gave me access to a woodworking shop, a TIG welder, and a machine shop, along with a sandblaster and a paintbooth. They also had a laser cutter, which I miss a great deal, as you will see in later installments. I packed up a cardboard moving box and drove down there to work for 3-4 hours every morning, saving the afternoons for paperwork or projects that could be accomplished at home with more ordinary power tools. 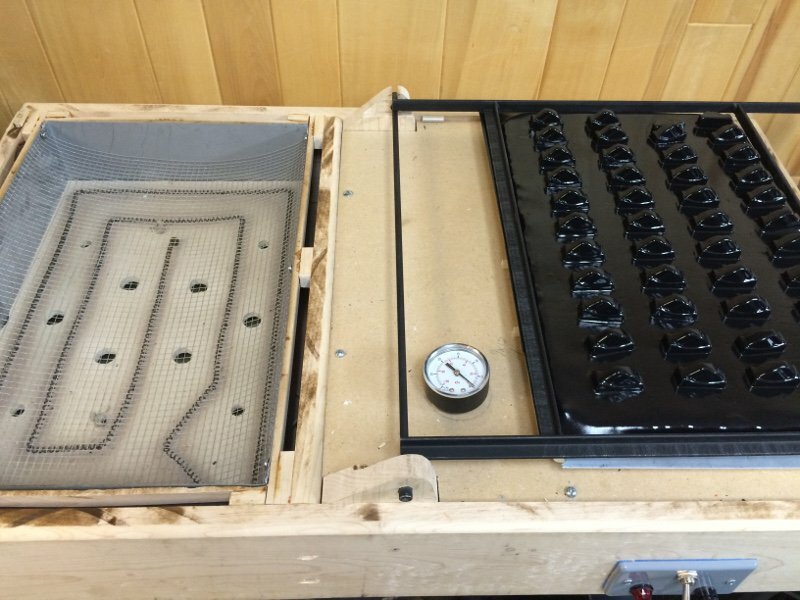 My hand-built vacuum thermoformer with a batch of hammer shrouds on it. Also the reason learned to TIG weld. There’s my thermoformer, made of maple, steel, and aluminum. I had ambitions to wire it up to code but it turns out that’s way harder than I had patience for. I haven’t shocked myself yet, though. Next time we’ll see the first prototypes to come off of it.